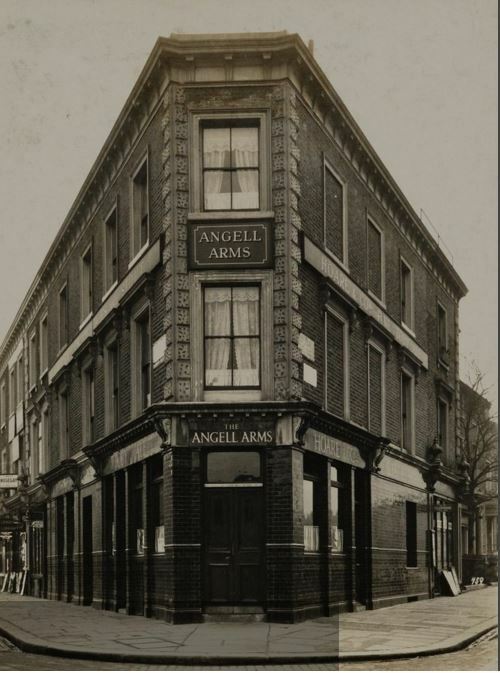 The Angell Arms was located at 2 Loughborough Road or formerly at 1 Angel Road. It was at the junction of Angell Road and Loughborough Road. This extract from Stanfords Map of London southern section, 1894 shows the location as the apex pointing to Brixton Road . The 1st landlord was George Brooke who had the pub from 1869 and was registered again at the Pub in the 1871 census along with his wife Eliza D, daughters Eliza A and Florence and sons George, Benjamin, Thomas, Frederick and Edmund along with Louisa Brooke, George’s mother and a domestic servant Mary Hartfield. The next recorded landlord was Valentine Day and his wife Emily with two sons Percy and John along with Emily’s Mother Clementine King. On the 3rd September 1878, the SS Princess Alice made “Moonlight Trip” to Gravesend and back from Swan Pier near London Bridge. At 7.40pm she was on the return journey very close to North Woolwich Pier where many passengers were to disembark. She was stuck on the Starboard side by the SS Bywell Castle, a coal carrier. She split in two and sank within 4 minutes. She was carrying a large number of passengers and over 650 died. 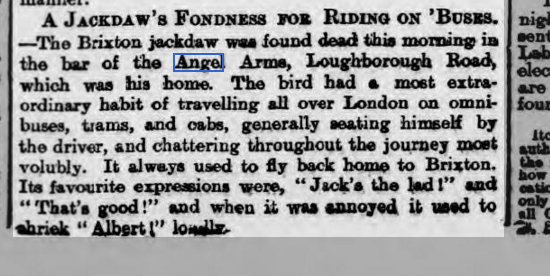 Amongst the survivors though were (as recorded) Mrs Dee and a child residing at the Angel Arms, Loughborough Road. It was the greatest loss of life in any Thames shipping disaster. Joseph Levi Beck is recorded as Landlord in 1901 with his daughter Ethel, 12 years and Harriet his niece aged 19 along with a domestic servant Alice Denton. This newspaper report from the Yorkshire Evening Post 17th Sept 1902. 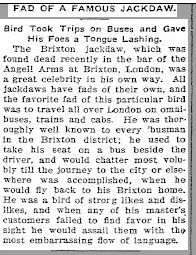 This clipping was published in the Castle Rock Journal on the 29 May 1903, a newspaper from Colorado USA so the story travelled widely nearly a full year after the Yorkshire report. A new landlord was recorded in 1919, Edmund John Wallis. This photograph is part of the National Brewery Heritage Trust collection and was taken in 1940 by Charrington Brewery as part of a architectural survey of their pubs. A landlady is recorded in the Post Office Directory in 1944 Mrs Olive Elder. There was significant bombing during WW11 and a major amount of rebuilding was undertaken in the Loughborough Road area. 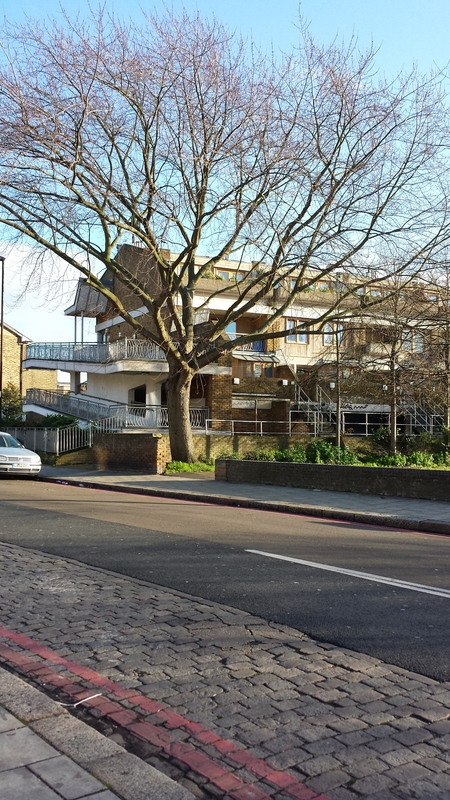 That part of Angell Road is now a housing estate and a small green area not very well looked after. The pubology website has the Angell Arms closed in 1971. Though this photo is available through Lambeth Library – Local History at Minet Library taken in the early 1970’s judging by the registration on the car parked on Angell Road. Thanks to Minet Library for making it available to me. Appreciated. This entry was posted in Loughborough Junction, Loughborough Road, Pubs, Streets & Roads. Bookmark the permalink.